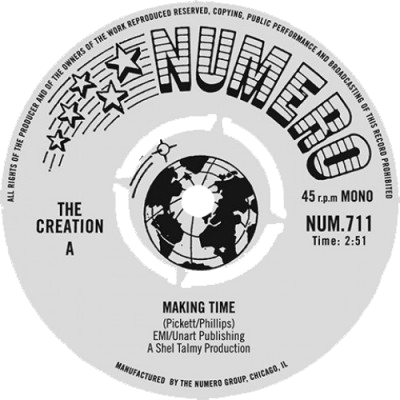 Issued on Shel Talmy’s Planet imprint in June 1966, “Making Time” stormed onto the scene as a rejection of dreary Britain. A wild and frenetic romp, the track opens with a killer riff, frenetic drums, lazy rhyming schemes, a massive break, before closing with guitarist Eddie Phillips’ soon-to-be signature bowed solo and a mess of feedback. This 2017 repress pairs the Creation’s debut with a previously unreleased instrumental version, with extra bowing and feedback. A UK-style break away center gives this juke-ready single an English flair.